Free Shipping Included! Car GPS Navigation System, TSWA Free Lifetime Map Update GPS Navigation for car,SAT NAV, 7“ HD GPS Navigator, Vehicle GPS Navigation with USB Cable and Car Charger & Mount by TSWA at iShare Maps. Hurry! Limited time offer. Offer valid only while supplies last. 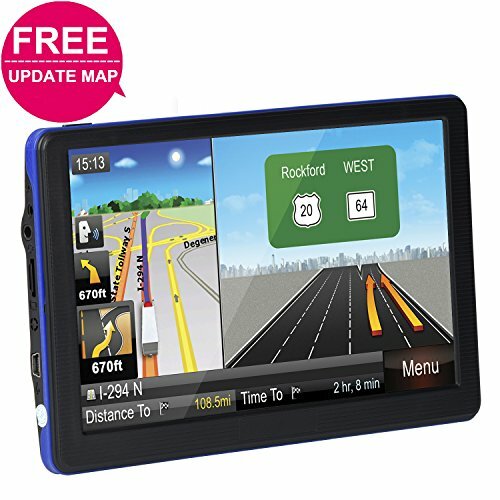 GPS unit comes with preloaded maps, including: United States, Canada, Argentina, Brazil, Chile, Colombia, Costa Rica, Mexico... Life time free maps update, please feel free to contact us to update. 3D Navigation help you place your position with the real world. It makes you easily choose exactly which lane to take before you approach an exit, turn or difficult intersection. 90 DAYS MONEY BACK GUARANTEE AND LIFETIME WARRANTY - We offer you 100% satisfaction 90 days hassle free money back guarantee, and lifetime warranty. If you have any questions about the product, please contact us via Amazon message. We will reply you in 24 hours. If you have any questions about this product by TSWA, contact us by completing and submitting the form below. If you are looking for a specif part number, please include it with your message.